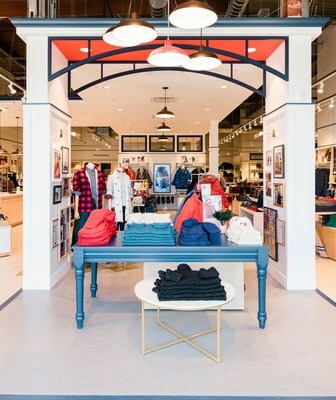 Lands' End Opens Second Store in New Jersey Just in Time for the Holidays | Lands' End, Inc.
DODGEVILLE, Wis., Oct. 29, 2018 /PRNewswire/ -- Shoppers in Northern New Jersey can find the perfect holiday gift at the new Lands' End store at The Outlets at Bergen Town Center in Paramus. The new store offers the iconic brand's apparel, outerwear and holiday gifts for men, women, and kids. The Grand Opening celebration begins with a ribbon-cutting ceremony by members of Paramus Regional Chamber of Commerce on Saturday, November 10, at 10:00 a.m.
"We're so excited to be a part of the community and look forward to making holiday shopping easier for families," said Claudia Mazo, senior vice president of retail, Lands' End. "Our loyal shoppers in New Jersey and the convenient shopping location make Paramus a great place for our new store concept." The new concept offers digital technologies—such as checkout anywhere in the store and a digital kiosk—that make shopping easier. For example, at the kiosk, shoppers can find the full Lands' End collection of holiday gifts for the entire family at landsend.com. Holiday-themed gift boxes are available for free to help make gifting easier. Store orders come with free shipping and all orders can be returned to the store free of charge. All items are backed by the company's Guaranteed. Period.® return policy -- if a customer isn't satisfied with a product, they can return it for an exchange or refund. The public is invited to join Lands' End in the celebration of its new store on Saturday, November 10, 2018. Inside the store, the first 100 customers will get a free gift—a Lands' End tote, one of the brand's heritage products—with a purchase of $75. Outside the store in the Courtyard, shoppers can visit the Lands' End Airstream on its Heritage Tour from 10 a.m. to 4 p.m. The Airstream is designed as a traveling Seagoing™ Duffle to celebrate two things: 55 years of Lands' End and its loyal customers. Everyone can enter the sweepstakes for a chance to win one of several Lands' End heritage duffles. In addition, kids can color an iconic Lands' End lighthouse drawing. Each child who brings their drawing into the store will receive a free keychain tote, plus, Lands' End will display their artwork inside the store. In addition, sign up for the chance to win a 5-day stay in a classic Airstream equipped with Lands' End Home products. The Paramus store is the fifth that Lands' End has opened in 2018. Earlier this year, Lands' End opened new stores in Bridgewater, N.J., Staten Island, Kildeer, Ill. and Burlington, Mass. This brings the total number of Lands' End stand-alone stores to 16 locations in the U.S. To find the Lands' End store nearest you, please visit the store locator on landsend.com.